Every year on King’s Day, 27 April, the Netherlands turns into one huge, joyous, orange party. We happen to think it’s the best day of the year. Here’s everything you need to know. And if you want to join us on the Max Brown boat in Amsterdam for the big day, call +31 (0)200 710 72 88 or email reservations.cd@maxbrown.com. On 31 August 1885, the Netherlands celebrated the birthday of their beloved 5-year-old princess, Wilhelmina, as the first national Princess’ Day. She became queen five years later, and the holiday switched to Queen’s Day in 1891. When her daughter, Juliana, became queen in 1948, she switched Queen’s Day to her birthday, 30 April. Her daughter, Queen Beatrix, decided to keep celebrating Queens’s Day on her mother’s birthday when she held the throne between 1980 and 2013. In 2014, her son, Willem-Alexander, ascended the throne, and he decided to switch the name to King’s Day and move the date to his birthday, 27 April. Every year, he and his family visit a new town and city to celebrate, and the whole country becomes a massive celebration of Dutch pride. 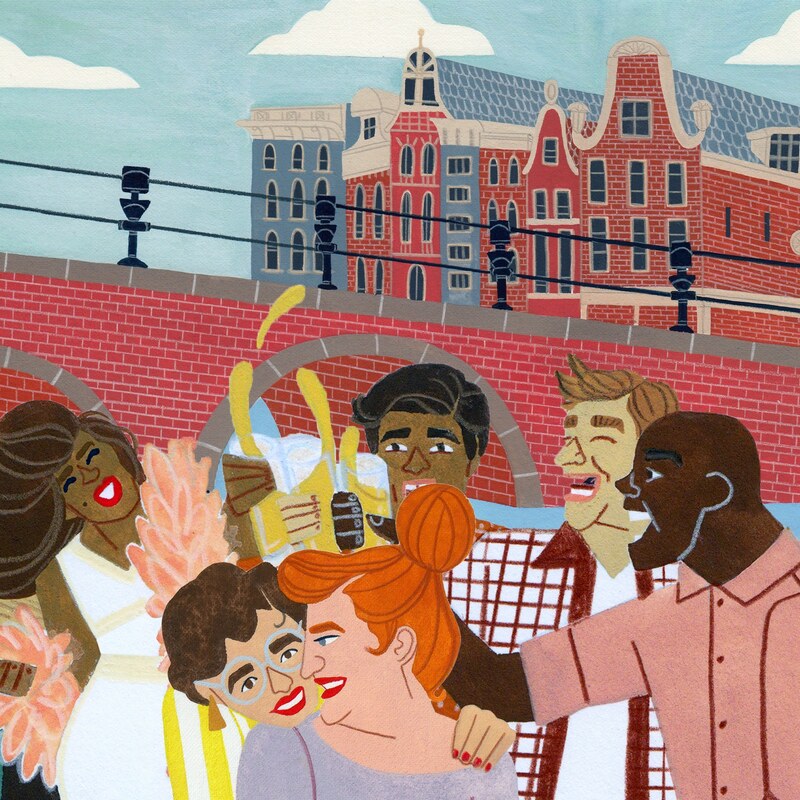 The night before King’s Day is known as King’s Night, and that’s when the party begins. You will find parties in bars, on public squares, on brightly decorated boats—everywhere. Don’t forget to wear your brightest Dutch orange for King’s Day and Night! You’ll see people in crazy costumes with their faces painted and hair dyed. Why orange? The Dutch royal family’s name is House of Orange-Nassau, and it’s become the country’s national colour. Amsterdammers toast to the king with Orange Bitters, an orange liqueur. The Netherlands was built on trade, and Dutchies still love to haggle and bargain. On King’s Day, the government allows people to sell their belongings on the street without a permit, so the country turns into one big market. When you walk through Amsterdam, you’ll probably end up buying cheap things that you don’t need. Never has gridlock traffic been so much fun. On King’s Day, thousands of brightly decorated boats pack the narrow Amsterdam canals. The next best thing to being on one of the boats is watching—and dancing—from one of the many bridges. Max Brown has its very own boat, and we’ll be out on the canals celebrating the big day. If you want to join us, call +31 (0)200 710 72 88 or email reservations.cd@maxbrown.com. Sign up for our newsletter to stay informed about the latest news, events and best rates. Melde dich für unseren Newsletter an, um über die neuesten Nachrichten, Veranstaltungen und die besten Preise immer informiert zu sein. Meld je aan voor onze nieuwsbrief en blijf op de hoogte van het laatste nieuws, evenementen en de beste prijzen.